Oculus Rift and HTC Vive are real things you can buy now, which means the sharp decline of humanity begins right about… now. Don’t believe me? There’s plenty of evidence that VR will destroy the world in works of fiction all around us, and as we well know dystopian narratives are concrete proof that inescapable doom is on its way. 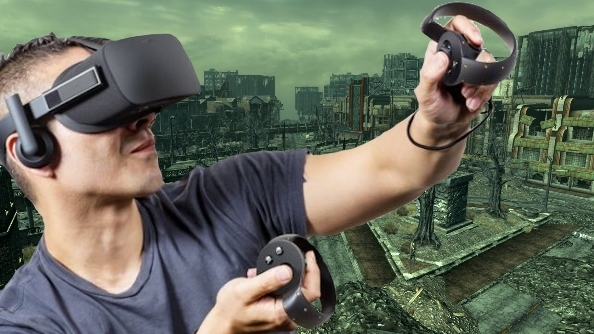 Scared of the VR apocalypse? 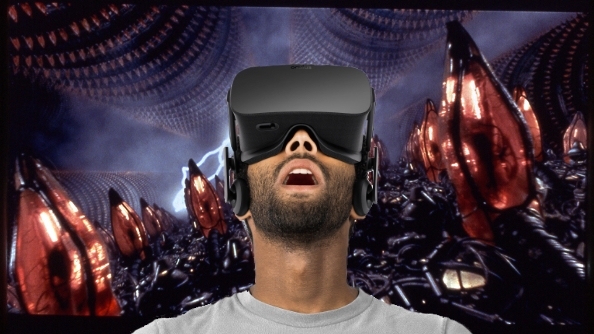 Don’t worry, virtual reality will fail. We hope. There’s no single, certain way that VR will bring the globe to its knees, but there are numerous possibilities. Today we explore 100% reliable fictitious sources in order to discover potential futures and foresee the downfall of the human race. At the moment, during the dawn of VR, you are required to strap a lunchbox to your face in order to enter the virtual world. But technology changes. One day, VR will be something beamed directly into our minds. Without the weight of sandwiches and a Capri Sun hanging from our foreheads, how will we know when we’re in the virtual world or the real one? It’s a situation handily captured in one good film and two dreadful ones known collectively as The Matrix trilogy, where all of humanity are happily going about their business without realising they’re actually in a VR environment while evil robots rule the real world and use babies as batteries. Just imagine it: we could all be so engrossed playing in VR that we wouldn’t know that terrorist robots were taking over the planet. And if someone did drop out of VR and saw what the world had become, they’d just think they’d booted up Fallout VR by mistake, and so go back to the real world (which is actually VR world), allowing the robots to carry on their evil baby-eating plans. Do you want to encourage the growth and spread of infant-powered AI? Of course not. 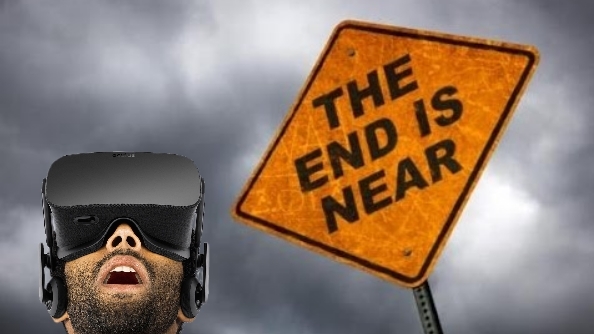 So please deposit your VR headset in the nearest incinerator immediately. The thing about VR is that it’s better than the real world. While mundane reality demands you abide the laws of physics and stay within your means, virtual reality is a playground where you can be anyone – anything – you want. The temptations of such can be seen in the likes of Ready Player One by Ernest Cline, where people wear VR headsets for hours, even weeks, at a time to forget their awful, poverty-stricken lives. As the world becomes even more decrepit through neglect, more and more people spend time at specialist cyber-cafes, plumbed into virtual reality chairs like a nation of those flabby human 2.0s from Wall-E. Children attend virtual schools and people have virtual jobs because the entire world has gone to hell. Which of course it will if we’re too busy prancing around in pretend worlds. A similar story can be read in D. J. MacHale’s The Reality Bug, where farmland and industry collapses because the population are too busy leading overly-perfect fantasy lives in VR. Do you want to encourage famine and industrial destitute? If you’re anti-dystopia, please hurl your HTC Vive in front of a bus as soon as possible. In this modern hell-scape we know as the 21st Century it’s difficult to know who’s in control thanks to corrupt politicians, shady corporations, and the ever-increasing cost of train tickets. But while real-life villains have to abide by the strict boundaries of reality, VR is just code that can be absurdly exploited. Have you seen Inception? Christopher Nolan’s confusing epic is basically about a few guys who trick a man into doing stuff for them by making him wear an Oculus Rift so they can pump ideas into his brain. So consider this: in Assassin’s Creed, Ubisoft are owned by Abstergo, a company controlled by Templars. But what if that’s not fiction at all, but is in fact real? 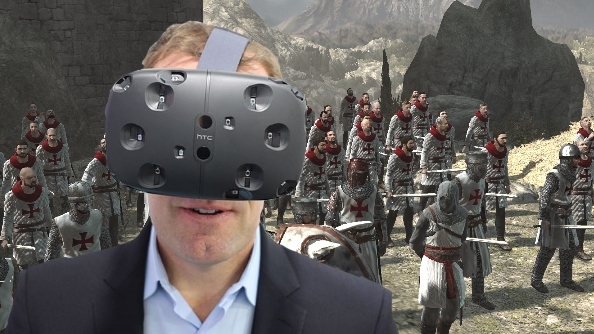 When Assassin’s Creed VR is inevitably released, its virtual open world could be full of subliminal messaging that reprograms our minds and creates an army of crazy Templar agents. Do you want to encourage Dan Brown to write more books about Templars? No? Then place your Oculus Rift in a microwave immediately. There’s a moment in Existenz, a film set largely in a virtual reality game, where Jude Law is very rude to a shopkeeper. He’s surprised by his own rudeness, but the shopkeeper explains that it’s not Jude but his VR avatar who is out of line. It’s something that consistently crops up: Jude finds it difficult for him to figure out if his actions are his own or the game’s. So if you don’t have control over your own actions, who does? 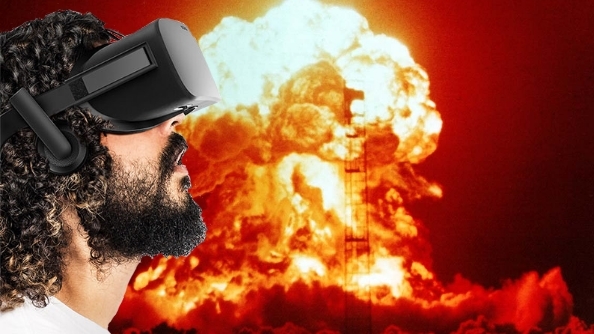 It all starts out fun and games, but soon VR will be the domain of virtual terrorists. Because your actions in VR are digital, they can be re-coded by hackers to make you do things out of character. You know how frat boys change the auto-correct on their dad’s phone to read “Hell yes!” Instead of “NO” and then message them asking if they can throw a party? VR is that on super-scale. So picture this: everyone loves VR. Even the President of the United States has a VR Oval Office. Then you, simple young Jimmy from Phoenix, Arizona, try to go for a virtual walk. Unlucky for you, cyber criminals have changed your inputs, and before you know it you’re in the POTUS’s office firing nuclear missiles at Luxembourg. Do you want to be the harbinger of nuclear apocalypse? Preferably not. Now’s a good time to drop-kick your doom-bringing headset. Convinced that VR is the nail in the coffin for humanity? Let us know your fears in the comments below.